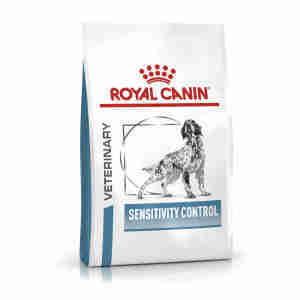 Royal Canin Canine Sensitivity Control SC 21 is a special food for dogs with food allergies and intolerances. Your dog might have been born with a food allergy or have developed one later on in life. If your dog's being sick a lot or having diarrhoea after eating, or if they're itchy or losing fur, a food allergy might be the cause. Your vet will be able to check your pet for other issues and confirm whether or not an allergy is causing their symptoms. If your dog has something like inflammatory bowel disease, colitis or gastritis, they might need medicine or other treatment as well as a change of diet. Luckily though, a change of food can make a huge difference to a lot of tummy issues, so it can be easy to make your pet feel a lot better quite quickly. contains fatty acids EPA and DHA and plenty of vitamins for healthy skin and a healthy tummy. Royal Canin Canine Sensitivity Control is full of all the things your dog needs to stay healthy and to keep their tummy feeling comfortable. It's made with just one type of protein, which means your dog will find it easier to digest his or her food and get all the goodness from it. If your dog's had a food allergy for a while, their system's going to need some TLC to get it back to normal. There are certain fatty acids, called EPA and DHA, that are especially important for healthy skin and digestion. These will help mend any damage done by your dog's allergies and give their immune system a boost. This includes giving your dog's skin some help to act as a barrier against substances that might cause an allergic reaction. If your dog's lost their shine since getting ill, lots of the amino acid L-tyrosine will help get their coat looking lovely and glossy again. Veterinary diets like this one have been specially made to support pets with specific medical conditions. Because of this, they might not be suitable for all pets, so we'd recommend getting professional advice before feeding this food to your pet. If you think your dog could benefit from eating Royal Canin Canine Sensitivity Control SC 21, why not have a chat with your vet? Dry - dehydrated duck meat, hydrolysed poultry proteins, vegetable fibres, animal fats, beet pulp, fish oil, soya oil, psyllium husks and seeds, minerals, fructo-oligo-saccharides (FOS), marigold extract (source of lutein). Duck & Rice Cans - Duck Meat, Rice, Fish Oil, Sunflower Oil, Cellulose Fibre, marigold extract (rich in lutein), Fructo-Oligo_Saccharides(FOS), trace elements (including chelated trace elements), vitamins. Chicken Cans - Chicken meat, chicken liver, rice, fish oil, sunflower oil, cellulose fibre, minerals, taurine, Fructo-Oligo_Saccharides(FOS), marigold extract (rich in lutein), trace elements (including chelated trace elements), vitamins.